Many times our clients want to ensure that their wedding or engagement session photographs are unique. We always love a challenge! Karishma and Mike wanted something unique from their wedding; artwork that they could put up in their homes. A week after their wedding we took Karishma and Mike to Stone Tower Winery in Leesburg, VA for a trash the dress session. The Trash The Dress Session originates from the concept that you've met the man of your life and will never need the wedding dress again; as such there should be a unique, fun and interesting way to document the end of the need for a wedding dress. 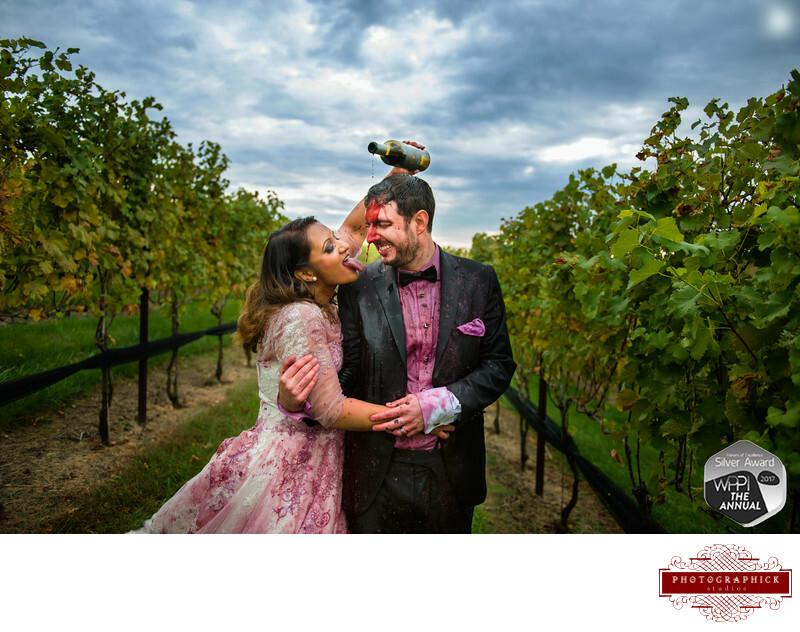 We took Karishma and Mike to Stone Tower Vineyard for their trash the dress session. The session started with an engagement session style getting photographs of the two of them having fun and in love. Soon after we opened a few bottles of wine and they began pouring the wine onto each other; first a little slow to simply show the color and reaction and then a full on wine bath. Their trash the dress photographs came out beautiful and won a silver award of excellence at WPPI. Location: 19925 Hogback Mountain Rd, Leesburg, VA 20175.